Ultrasound of a dog or cat’s abdomen is very valuable in diagnosing a variety of conditions. It is one of the most accurate ways to find the presence of a growth or tumor in the abdomen, even at an early stage. With this information, early diagnosis and treatment often leads to a better outcome. Pet Ultrasound can also be used to help decide whether surgery is necessary and what the future prognosis may be. In addition to looking for growths, pet abdominal ultrasound can detect abnormalities with many organs inside the body. Ultrasound allows us to look at the kidneys, to help detect signs of early kidney disease. Pancreatitis, a common and sometimes painful disease is often best diagnosed with ultrasound in dogs and cats. Ultrasound also allows us to look at digestive organs such as the liver, stomach, small intestines and colon. Even though endoscopy or colonoscopy are the most accurate tests to diagnose diseases such as inflammatory bowel disease and cancer of the intestines, ultrasound can provide valuable information to determine if these procedures are necessary. On occasion, biopsy can be performed with ultrasound which is a far less invasive procedure than exploratory surgery. Pregnancy diagnosis still remains one of the most common uses for abdominal ultrasound. 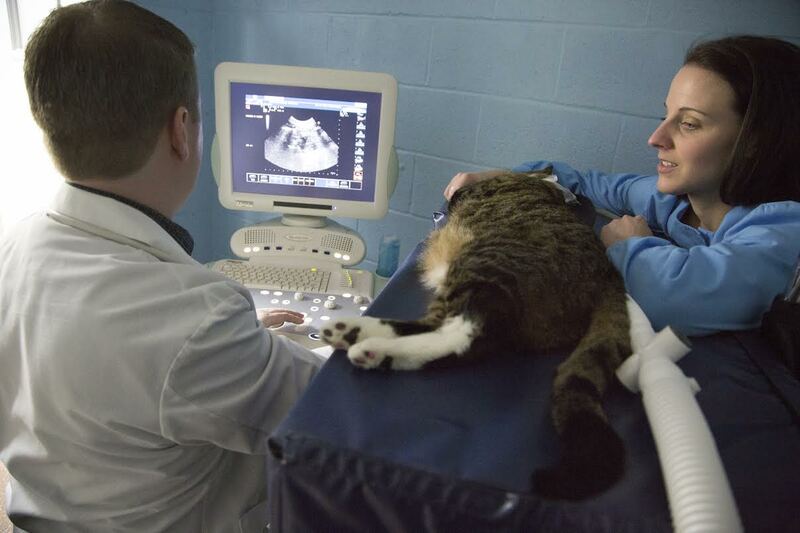 Ultrasound of dogs and cats usually allows for earlier diagnosis of pregnancy than x-rays. Chest or Thoracic Ultrasound is useful in diagnosing some conditions in the chest but the presence of air in the lungs can occasionally make it difficult to use. In spite of this disadvantage, there are still some situations where growths or tumors of the lungs can be diagnosed and biopsied or aspirated by using ultrasound. This is also a far less invasive procedure than open chest biopsy. Echocardiography in dogs and cats is a procedure that is performed using ultrasound. The doctor can get an extremely accurate image of the heart. This study allows a close examination of the heart valves, the muscle of the heart, the blood vessels, fluid in the pericardium (a sac around the heart) and can even demonstrate the presence of heartworm on rare occasion. Medications are often prescribed based on these ultrasound findings. The above only scratches the surface of the extraordinary value of diagnostic ultrasound in dogs and cats. 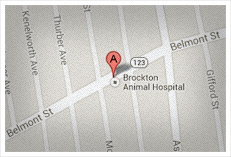 The Brockton Animal Hospital has been offering this service for several years and recently updated our equipment to boast the most up to date equipment available. Please contact us if you are interested in finding out whether ultrasound could be of value for your pet.